Here’s another simple dinner idea. 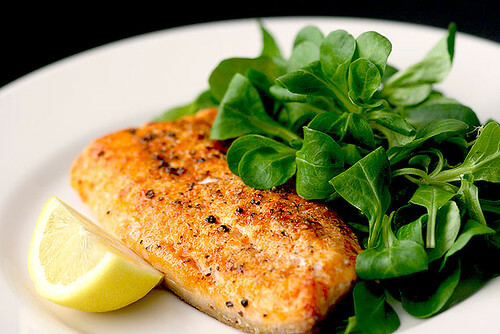 Steelhead is similar in a lot of ways to salmon but it’s actually a trout. It has a mild flavor and really takes to the seasonings you apply to it. This is too simple to even bother with a recipe. C’mon, you can do this. Me, I simply sprinkled the filet with paprika, fresh ground pepper, bacon salt and garlic powder. Then I squeezed lemon juice and drizzled a little EVOO on it, covered it and let it marinade in the fridge overnight. The following evening, I popped it in the broiler for about 10 minutes and there you go. I nice dinner paired with a simple mâche salad, drizzled with olive oil, lemon juice and balsamic vinegar. Sometimes you get lucky you get to whip up something quick with whatever’s about to be thrown out from the fridge. Yes, I hate to waste anything. Luckily, the challenge of coming up with a killer dish from whatever’s left over from the week before intensifies my hunger even more. Makes me feel like a mini Iron Chef, even. Except for the orzo, everything in here is leftover stuff. And they just happened to be the perfect combination for a delightful dish that I will definitely be making again and again, in the (near) future. But for now… let’s savor the prototype, shall we? The sun-dried tomatoes I used here are the dry ones. So, I needed to rehydrate them in hot water for about 20 minutes or so. If you have one in a bottle soaked in oil, you can skip this part. Directions: Cook orzo to al dente, as directed in package. Meanwhile, in a medium-low heated pan, sweat a few pieces of julienned sun-dried tomatoes in olive oil (its own, if possible) along with some minced or chopped garlic and a dash of red pepper flakes. Stir until garlic starts to brown a little. Make sure not to burn the garlic. When orzo is cooked, drain using a strainer and transfer to the pan. 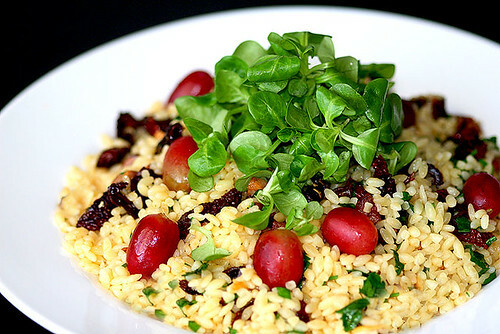 Add chopped parsley and grapes and mix thoroughly. Serve on a plate and garnish with as much mâche as you want. This is one garnish you want to have more of, trust me. Ever since I found out about mâche, I’ve been using it a lot. Seriously, I like this better than spinach. And mind you, I love love love spinach! But the mache’s flavor is so versatile and mild you can use it in pretty much everything from salads to soups to plain munching it by itself. Heck, it’s even pretty enough to use for garnish! 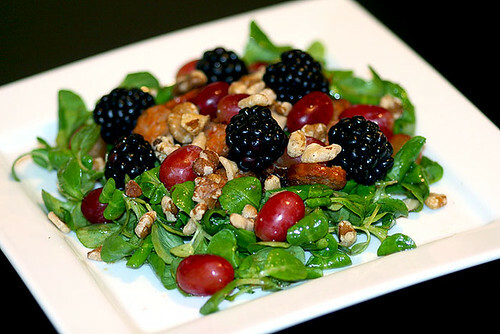 Here’s a salad I made for lunch today with simple ingredients like grapes, black walnuts and leftover sausage pieces. It’s very good with a fruit based dressing. I ran out of mango dressing so I used raspberry vinaigrette on this one. Also, as you notice in the photo, I added some blackberries but found it to be unnecessary since it was hopelessly competing with the grapes whose flavor is overpowering. It looks pretty but I would omit the berries next time and simply let the grapes shine (and compliment the mache) on their own. Directions: In a salad bowl, coat mache rosettes with dressing and a little ground pepper. Transfer to a serving plate and top with everything else. Sadly, I don’t get to eat seafood a lot anymore. But I’m trying to change this now. I grew up eating fish or shrimp a few times a week, every week. So, these days, when I remember to grab a filet from the fishmonger, it almost seems fancy, or even decadent. This shouldn’t be the case as they are simply delicious and they are nutritious. Well, yesterday I got me some fresh (well, as fresh as it gets, here in the high plains) scallops. How often do we have scallops? Probably not as often as we have burgers or hotdogs. It definitely felt a little fancy. And these are some mighty good eats, if I may add. Go have some and you won’t be disappointed. Just remember with any seafood, be careful not to overcook unless of course, you like chewing rubber. Make a salad out of it, if you want. I have tried both shitake/sesame vinaigrette and mango pureé and they are wonderful. Oh yeah, I was able to made good use of the mâche on this one. Directions: Wet scallops with olive oil and sprinkle with seasonings. Grill 3 minutes on each side. 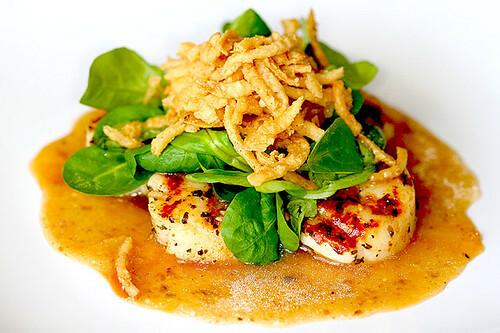 Make a salad and mix in fried onions and grilled scallops. At the grocery store this afternoon, I was going to pick up a box of baby spinach when I noticed this one, right beside it. What in the world is Mâche Rosette, I thought. Kinda shows the extent of my veggie vocabulary, doesn’t it? Well, it sure didn’t take much for me to decide to pick it up instead of the spinach. I mean, look at it! It does resemble the baby spinach but a lot smaller. It just looked fantastic. I know I’ll be in for a treat with this one. On my way home, I couldn’t wait any longer that I opened the box in my car and started munching on a bunch just to see how it tasted. Man oh man, was I in green heaven or what? It does have that spinach personality to it but I think I like it even more. It’s a lot milder and a bit nutty in flavor. I swear you don’t even need anything else to go with it. Heck, not even dressing, in fact. So, here it is. I’ve made a uhh… Mâche Pit, if you will, and I’m trying to figure out a way to make it rock even more than it already does. How about a little grilled chicken with shitake and sesame oil? Or a few pieces of blood oranges with red wine vinaigrette. Maybe I should go back to the store and grab a bag of frisée to add to it. I don’t know. Well, this ain’t gonna last long before it goes bad. If anybody has had it before, your suggestions would be very much appreciated. Thank you.